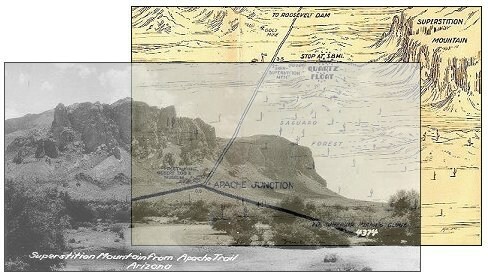 This website presents a descriptive annotated bibliography of books and pamphlets written about the legend of the Lost Dutchman Mine, Superstition Mountain, Jacob Waltz and other related topics. If you are looking for a discussion of these topics and not the literature start with one of the sties listed just below. Otherwise, to get started see the Introduction, or start with Core Works. Also see: Related Works, Fiction and Poetry, Western Fiction, Juvenile Fiction, Art, Maps, and Publishing Chronology. Also of interest: Postcards, Artists (no longer being updated), and Images of Superstition Mountain. - Tom Kollenborn's Kollenborn Chronicles. - Thomas Glover's The Lost Dutchman Mine of Jacob Waltz. - Lost Dutchman Gold Mine Forum.